The stunning First Edition Kaleidoscope papers are perfect for making crafts for your next summer party. Use the free printable templates to make your own version to suit your party theme or special event. Cut a piece of First Edition 12” x 12” Kaleidoscope paper into a 12.7cm square and use your free pinwheel template to cut into the paper. You can use the Dovecraft scalloped scissors to cut the paper to create an interesting feature. Pierce the corners and centre of the pinwheel where there is a circle on the template. Gently bend each pierced corner into the centre of the paper and use a split pin to keep each section together. With a card straw, flatten one end and pierce a hole at the top and feed the pin through it. Cut your chosen piece of First Edition 12” x 12” double sided paper down to 30.5cm x 22.3cm and with your free printable template, cut and score as followed. To finish you can stick the sides together or as we have done, use mini pegs to clip the smaller panels together, a great instant bowl. Cut a piece of the First Edition 12” x 12” Kaleidoscope paper into a 24.5cm square. Follow the snack box template for your cut and score guidelines. To create the dividers, two piece of the same First Edition 8” x 8” Kaleidoscope papers to 24.5cm x 6cm. On the centre panel, cut a 3cm slit in the middle to half away down so you can slot the dividers together. Use double sided tape to stick the panels together and stick the dividers to the side of the box. Cut a piece of 8”x 8” First Edition Kaleidoscope paper to 27.2cm x 17cm. Across the paper, score and fold it at 1.4cm, 11.4cm, 13.9cm, 14.3cm,24.2cm & 25.7cm. To create the base for your card, score and fold 3cm from the top of the paper. Cut the sides of the square panels at the top of the paper. Fold the cut side panels inwards and cover with the larger panel. Fold the remaining panels; ensuring the bottom panel is stuck on top of the winged panels. At the opening of your gift bag, whole punch so you can create a ribbon handle. To finish, stamp the ‘Let’s Celebrate’ stamp onto a contrasting piece of paper and cut to 6.3cm x 4.8cm and stick to bag with foam pads. You can also make a smaller Party Treat Bag with our free printable template here. Cut five 3.4cm x 4cm triangles in the same First Edition Kaleidoscope paper. With contrasting paper from the same pad, die cut the word ‘Party’ using the First Edition Alphabet Varsity Die. Stick on top of a 24.5cm piece of green Ric Rac ribbon using glue. Flatten the top of the card straw and then stick the ribbon bunting to the flattened bit of the tube. Cut 2 pieces of green First Edition Kaleidoscope paper to 6.8cm x 10.3cm. Cut a curve on one side of the papers to create a lollipop shape. With a lollipop stick, add the lollipop paper to each side using double sided tape. We have then cut a piece of the multi coloured glitter paper to 6.8cm x 5.5cm and cut into the paper to create a ‘melted’ effect, cutting the excess from the top to make the lollipop shape. We have then decorated the glitter paper with sequins. To finish, we have cut a smallest tag from the First Edition Tag die set and attached it to the lollipop stick with a piece of twine tied into the a bow. These would make cool party invites or fans on a warm day! Alternatively, you can add several ‘flavours’ to your paper lollipop by layering 3 different papers on top of each other or you can use Dovecraft scalloped scissors and cut some of the lollipop off to look like a piece has been eaten. 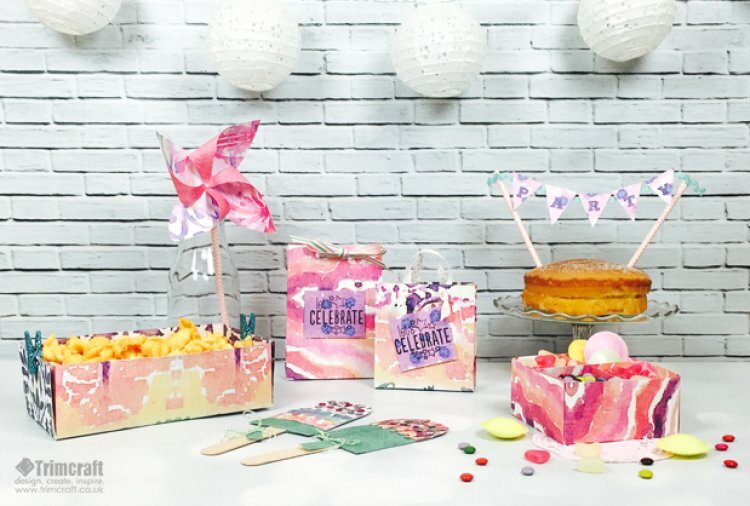 We would love to see what you make with these handy tutorials and free printable templates, simply upload and share your crafty party makes in the project gallery.